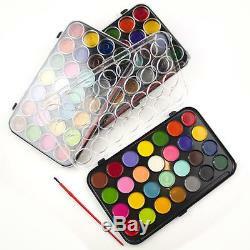 Water Colour Paints & Brush Set. Are ideal for painting pictures on paper or card. Each set contains a generous assortment of 28 colours in separate pots and a paint brush. The case is made from lightweight but durable plastic. 24cm x 15cm x 2cm. The item "Water Colour Paints And Brush Set of 28 Colors Kids Art Craft Artist Box Case DW" is in sale since Friday, March 03, 2017. 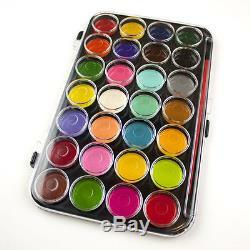 This item is in the category "Crafts\Art Supplies\Painting Supplies\Paint\Watercolour Paint". The seller is "gilpinc-123" and is located in torquay, Devon. This item can be shipped worldwide.